A new start – a new life. So why is it just like high school all over again? 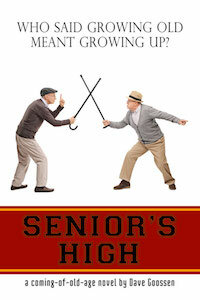 A novel about growing old, growing up and trying to find your way, no matter how old you are. Having moved with his daughter and grandson from his farm in Montana to a senior’s home in small-town North Carolina, Paul Carter finds himself mighty surprised when, after a long and independent life, he’s suddenly being told by the officious owner of Shady Acres what he can and can’t do. Not to mention the gossiping Queen Bee’s and the past-their-prime jocks complicating his life as the ‘new kid.’ Even worse, his grandson, Devon, is dealing with the same issues across town at his new high school. For Paul, too many rules mean it’s time for stealthy rebellion and youthful high jinks. But when past tragedies come back to complicate the present, in ways no one would have imagined, lives are thrown into turmoil. Shady Acres owner clamps down on everyone’s freedoms, forcing Paul to take a hard look at his life, realize what it means to be alive and fight for all their rights before it’s too late. Full of heart and soul, teenaged and octogenarian rebellion, practical jokes and secret fishing trips, ‘Senior’s High’ asks us, Who Said Growing Old Meant Growing Up? Sign up for my email newsletter to keep up to date on publishing info!